Emotan who was born between 1380 and 1400, hailed from Eyaen village, close to the present day Aduwawa cattle market area, along the Benin-Auchi Road. The name her parents gave to her was Uwaraye. As a young woman she married Chief Azama of Ihogbe district, as his second wife. Uwaraye was considered indolent by her husband because she could not cook. She could not get pregnant either. Azama´s first wife, Arabe, handled the domestic chores and gave birth to all the children of the household. Azama soon nicknamed Uwaraye, Emitan, corrupted to Emotan, meaning lazy bones. She had a redeeming feature, though. She was good at helping to nurse and take care of the brood of the household. Emotan who could make evbarie´ (a soup seasoning condiment made from fermented melon seeds), and spin threads from cotton balls, began taking these plus some herbal products to sell at a stall opposite the city market (present day Oba market). When her husband died, she could not return to her parents home because they too had died of old age earlier on. She set up a hut to live in at her trading post opposite the market place. Her hut soon became a popular make-shift nursery for the children of families patronizing the market. She attended to the children's health and other needs selflessly without charging fees and the kids' parents soon could not have enough of her services. Some Historians are of the view that Emotan was a market woman who took care of little children, whilst their mothers were away buying and selling their wares in oba market. They refer to her as the woman who began the first "DAY-CARE CENTRE" in Benin City. his legitimate position as king. Prince Ogun in those times of travail, paid secret and nocturnal visits to Benin from his place of exile. After his ouster by his younger brother, Prince Ogun (Oba Ewuare I) found his way to the house of this beautiful woman opposite the market place in the city. She was powerful mystic and childless. She was also very loving and generous, hence It was in her nature, therefore, to agree to have Prince Ogun as her guest and to help him take back his stolen crown. On one occasion, Emotan had to go an extra mile spiritually, to hide prince ogun from his adversary. As soon as the army moved their search from the hut to other areas in the vicinity, Prince Ogun sneaked out, avoiding the path of the army and headed straight for the palace where he killed his usurper brother, Oba Uwaifiokun! The news of his action soon spread around the city. Ordinary citizens were supportive of his action, insisting that it was Ogun´s right to do what he did and expressing joy and hope that the tragedies of the recent past had ended because justice had prevailed. Emotan sent word to Ogun to stay put in the palace and consolidate his hold, while she continued the spiritual work from her home. So deep was her love and empathy for Prince Ogun. Within a few days, the Edion´isen had come around to show support to Ogun, eventually crowning him as the Omo N´ Oba Uku Akpolokpolo, Oba Ewuare. His divination title choice of ´Oworuare,´ alias Ewuare, could not have been more apt because it means, after the heat, the cooling effect of rain. Oba Ewuare appointed Emotan as the Iyeki ( leader of the authorized Ekpate guild), tasked with security matters in the market and with enforcing market rules. Emotan died not too long after Ewuare´s ascension to the throne of his forefathers. The Oba decreed that she should be buried in her hut. Later the grave was marked with an Uruhe tree and her deification as the conscience of justice was ordered by the king. Every celebratory procession in Benin, pays homage to her burial site. The first Uruhe tree (marker) survived for some three hundred years before it fell. The replacement Uruhe tree, survived for about one hundred and fifty years before an Iroko tree was planted to support it. A severe storm later fell both trees. 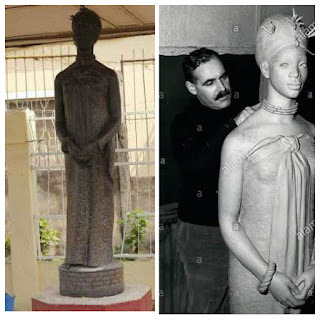 Then, in 1954, Oba Akenzua II, in collaboration with the British Colonial authorities, commissioned a life size bronze statue of Emotan as a young woman. The befitting image was sculpted by Mr. John A. Danford, in his Chelsea, London, studio in 1951, from a miniature model cast by Igun Street artists.